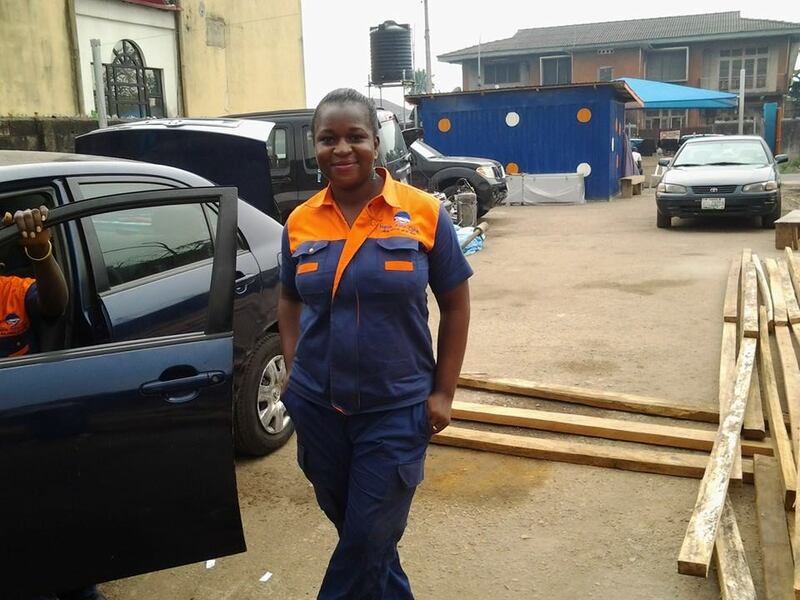 Isazoduwa ‘Oduwa’ Agboneni is a woman determined to bring professionalism to the Nigeria auto repair industry. A chartered Mechanical Engineer and an entrepreneur with a vision to be a serial entrepreneur, Oduwa is the cofounder of Hilltop Travels and Tours Limited and Nenis Engineering Limited, an auto care shop in Lagos, Nigeria. With a Bachelor’s degree in Mechanical Engineering from University of Benin and a Master’s degree in Geoinformatics Technology from the University of Lagos, Oduwa is dedicated to improving the image of the Independent Automotive Repair Industry through education and by offering quality automotive service. 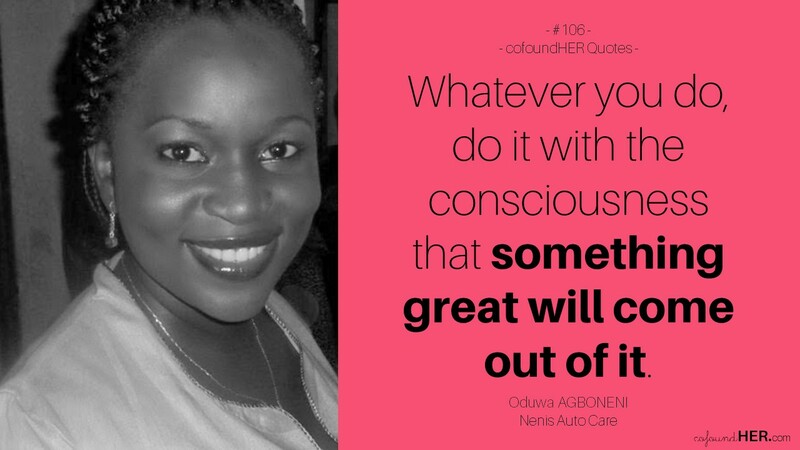 Using the skills and experience she has garnered over the last nine years, Oduwa intends to build a business that will compete globally with other automobile servicing companies. 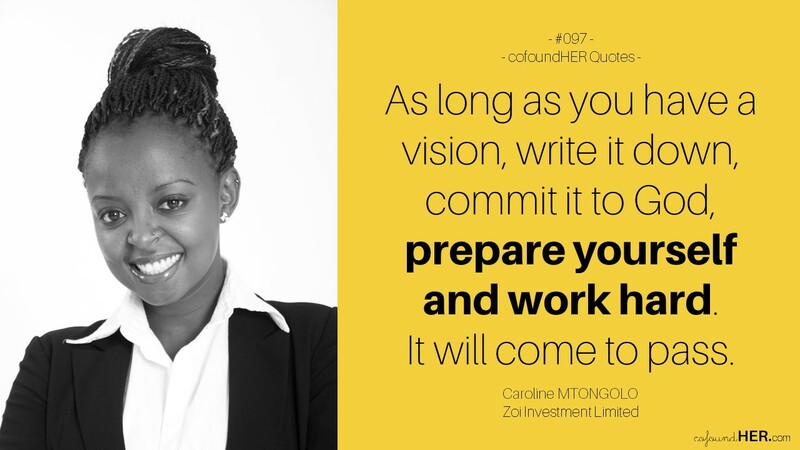 When she is not spending time at her company or with her family, Oduwa enjoys aerobics, surfing the internet and reading — her favourite book right now is She Wins, You Win: The Most Important Rule Every Businesswoman Needs to Know by Gail Evans. Tell us about Nenis Auto Care. Nenis Auto Care is a one-stop shop for your car care needs. At the centre, we provide high level automotive care for our clients including services like car wash and detailing, auto diagnosis and repairs, body repairs, and engine replacement to mention a few. Our services are targeted at women who deserve a car care center that is in a safe, enjoyable atmosphere at the best price around. Why did you chose to focus on women? Our focus is on women because we found out that they control over 80% of all vehicle purchases and that close to 80% of all auto repair and car wash errands are arranged, dropped off and picked up by women. Many women clients feel uncomfortable and even intimidated in some auto repair shop and we think women deserve a repair shop they can fully trust, where they will be treated with the respect they deserve. We’ve had impressive comments that put me in the right direction. Ladies are interested in my service and when I exceed their expectations they spread the word about my service center. When I still had a 9 – 5 job, I started doing online ticketing and reservation for my family members and friends as a hobby and an extra stream of income. Becoming an entrepreneur was my next action when the company I was working with folded up in 2012. I decided it was time to take a radical decision to venture into my own business. I enrolled in an aviation business school where I took courses in travel agency operation and management, went ahead to get a diploma in foundation in Travel and Tourism (IATA DTTF). After my certifications I founded Hilltop Travels and Tours Limited in 2012. The urge to open a car care center was born during my church’s annual convention, WAFBEC, in January 2014. I have always wanted to provide solutions to people’s car maintenance request in a professional and honest manner, especially in a relaxed and conducive environment. During the conference, I keyed into a prophetic declaration of owning an automobile industry. Two weeks later when I traveled home, I and my sisters (Osasere, Oyenmwen, Muyi and Osa) were having a discussion with my mum and without them knowing my inner desire of owning an auto garage, they advised me to practice my profession by setting up an auto diagnostics center. With the excitement in me, I shared the news with my husband on phone and he was in full support. I knew I was in the right direction. I set up Nenis Auto Care where I am in control of the quality of service rendered. There will always be a demand for good mechanics and excellent customer service. My career allows me to be creative and innovative. It provides me with an ideal setting where I can see my own ideas come to fruition, and an opportunity to use my personal strengths and passions to make an impact. Now, I have the ability to set my own life on course and attain career fulfillment as well as leave a lasting and tangible legacy by building a brand that would outlive me. You can’t necessarily do that in a corporate setting. I was super excited. The programme is a breakthrough; it opens doors to business opportunities and improved entrepreneurial practice, and gives a platform to showcase you to Africa, which is good for business. The lengthy application that had over fifty questions was the most difficult part for me. The time spent answering the questions, although long, was a blessing in disguise because as an entrepreneur you have to be patient in doing things to avoid mistakes. What has been your number one business challenge and how do you think TEEP will help address it? Entrepreneurship training. TEEP so far has exposed me to a lot of training that an entrepreneur should go through, especially with the assistance of developing a business model. With the benefits, my business will gain exposure to the world improve our pricing strategy, get access to funds and networks, and learn how to remain ahead of the competition. Whatever you do, do it with the consciousness that something great will come out of it. Every small thing in life has value. Use what you have as your starting point. *To learn more and stay up to date, follow Oduwa on Twitter and Nenis Auto Care on Facebook, Instagram and Twitter. Since her early teens, Farida Musa Halliru has been sketching designs, but her fashion design career really started in 2012 after she completed a course on fashion design and garment construction from The Fashion Academy, Abuja and started her own bespoke fashion design company, Farida’s Atelier. 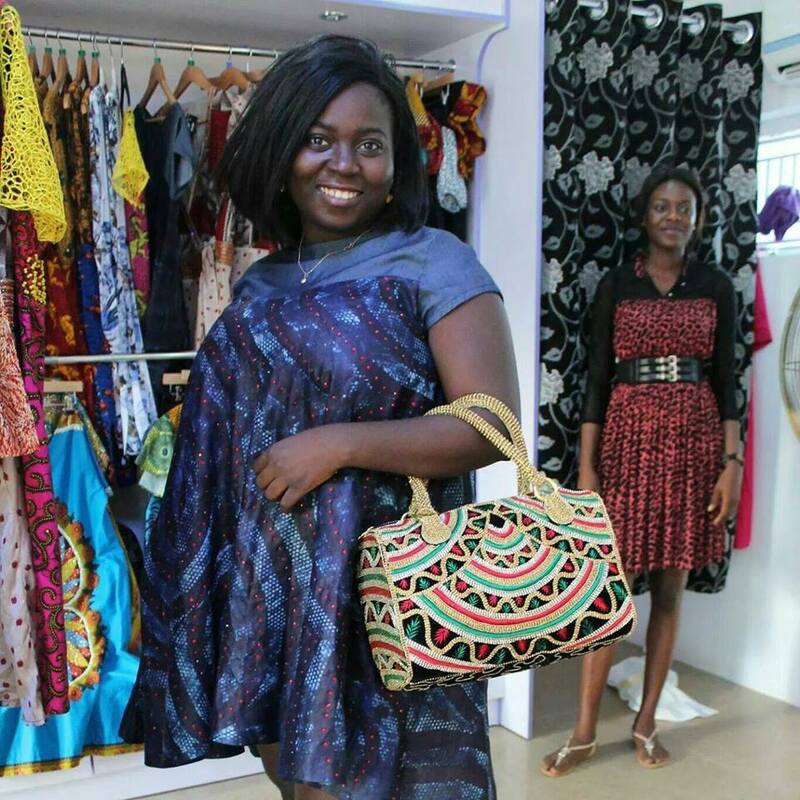 Farida’s designs are mostly African inspired with Western aesthetics. She also sometimes gets her inspiration from objects, prints, colours, nature, and basically anything that grabs her attention. When designing Farida puts the African modern woman in mind and focuses on designs that are flattering to her body. From Kano state in Northern Nigeria, Farida is an Alumnus of Ahmadu Bello University, Zaria with a degree in Accounting. She loves watching movies and TV shows, listening to Nigerian music, especially The Mavins, Di’ja and Yemi Alade, and playing basketball, at least that was before her career took over her everything. Farida’s Atelier is a fashion brand that makes bespoke clothing for women with the aim of achieving the perfect flattering fit. We are also introducing high street ready to wear pieces to bridge the gap in Nigerian fashion retailing. 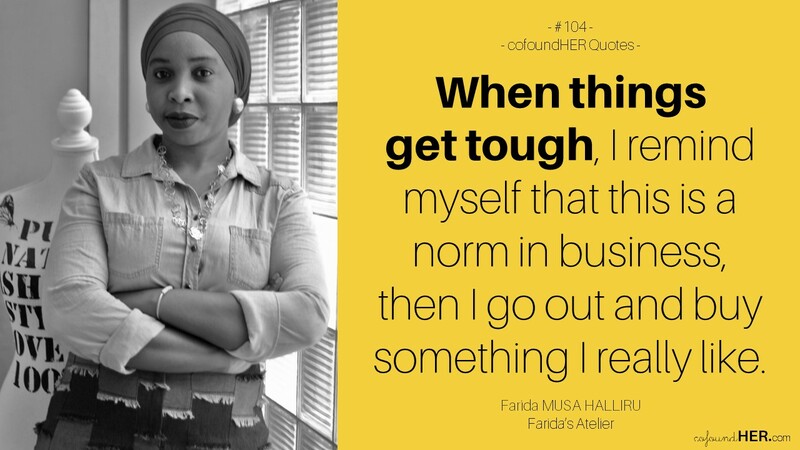 Why did you decide to start Farida’s Atelier? My decision was mostly from tailors’ lack of craftsmanship and dedication; there was little or no professionalism and integrity in their work. This is something a lot of people and I personally have experienced. Also, flipping through African magazines and seeing the unflattering outfits some women wear that they label as the latest “fashion trend” makes me feel sad. Tailoring should complement a woman’s body to accentuate her unique features. So, I went to a fashion school to acquire the necessary sewing skills I needed. Sketching wasn’t a problem for me because I’ve been sketching since my primary school days. My passion in fashion was something I was born with so the drive was there. I’ve always been a smart business woman, coupled with my training in customer care and better understanding of a client. That was it, Farida’s Atelier was born. How did you get started? What was the first thing you put in place? I first started by enrolling in a fashion design school. After completing the course, I registered my company business name. I really didn’t have enough money to set up the business so I tried looking at getting funding from the government and banks but all seemed to no avail. That’s when my family came in. My parents and siblings, everyone chipped in and I got the loan from them to start up a small workshop. I needed to test the market and grow as the market expanded. So, knowing how expensive rent is in Abuja, I built a port-a-cabin at the back of my apartment, bought two straight sewing industrial machines, one embroidery machine, one serger machine, and a very good Belgium Iron. The other sewing necessities came after as the work proceeded. Shortly after I started, I was able to pay back all my loans. We’ve been operating since 2013 and this year (2015) we’ve moved into a proper workshop. I’ve showcased in two runway shows, one in Abuja, Nigeria and the other in Amsterdam, Netherlands. In both shows, I’ve won awards of Best Designer 2014 and Emerging African Fashion Designer 2014. It hasn’t been easy but I thank Allah for everything He has done for me. What was the most difficult part about applying for the Tony Elumelu Entrepreneurship Programme list and how did you feel when you heard you made the list? For me, the most difficult part was filling the form and wondering if I was being myself and if it was good enough to get me in. When I found out I made the list, I was quiet about it for hours. I didn’t tell anyone because I couldn’t believe it myself. I wasn’t sure if the video was sent to only the shortlisted applicants or everyone; it took me over two hours after the mail came before I opened it because I didn’t expect to be chosen. Was there any time you felt like giving up? How did you overcome that feeling? Sincerely, since I started, no matter how tough and difficult the situation gets in the business I have never for once felt like giving up on it. All I do when it gets hard is pray a lot, then talk to my sister or my significant other to offload. Sometimes, I just stay in my room and reflect on new strategies and remind myself how important this is to me and this is just a norm in any business, then I go out and buy myself something I really like but wouldn’t ordinarily spend money on because I’m trying to manage my funds. It usually gets better after that and I’m back in the game. What is your ultimate vision for Farida’s Atelier? I want Farida’s Atelier to be a household name and I want to showcase my designs on the biggest runways all over the world. 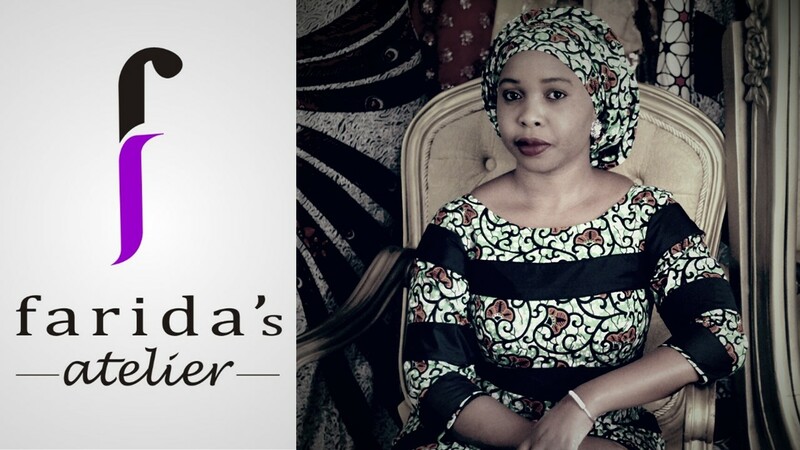 I want Farida’s Atelier to go in history as one of the African fashion houses to take African fashion worldwide. How can someone place orders and do you ever turn down clients? Presently I only have one workshop/showroom in Abuja and so orders are made there either through a phone call, by email or walk-in. I have actually turned down clients in the past and even now. Back then, because I was operating in a small space with only two machines, I always avoided situations where I collect an order and end up disappointing the client. I’d rather be honest than give myself a bad name. In today’s case, sometimes when we get late orders and we have so many other early orders we have to turn down the late orders to avoid problems and potential disappointment. Look within and identify your true passion, stay true to yourself and stick to it, it will make you stronger and most of all believe in yourself, it would definitely not be easy but you will surely fall through. Find out more about Farida’s Atelier on Instagram. We are sharing the stories of 30+ African women entrepreneurs who are beneficiaries of the Tony Elumelu Entrepreneurship Programme. and whose ideas can change the world. 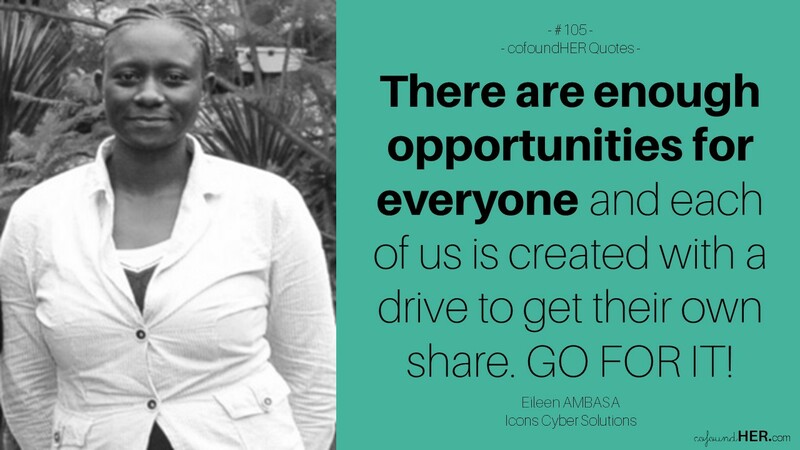 Visit http://www.cofoundher.com and follow the TEEPcofoundHER series HERE. 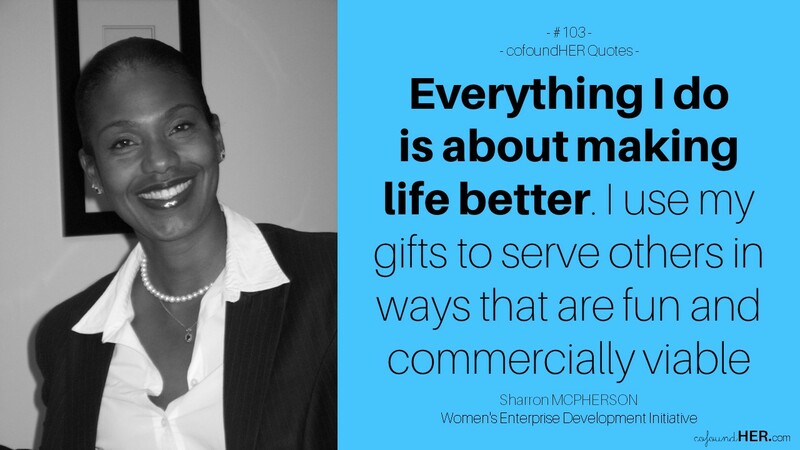 Former Investment Banker and Wall Street Attorney turned serial Social Impact Entrepreneur, Sharron McPherson’s entrepreneurial journey goes back to the mid ’90s when she started ISES, a successful non-profit organisation in New York City that helped local women from disadvantaged backgrounds start and run successful community based businesses. 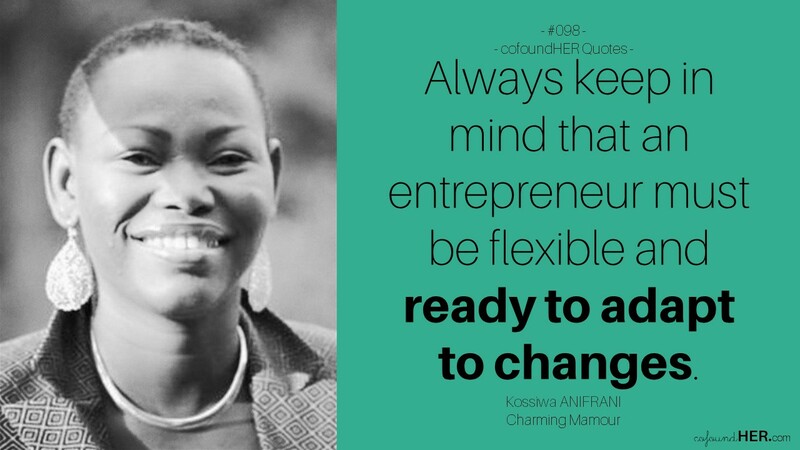 Her next company, the Women’s Enterprise Development Initiative (WEDI) grew out of ISES when she moved to South Africa and was encouraged by women in the United States to launch something similar. My passion remains community upliftment and investing in small and medium sized businesses has been my vehicle of choice for community transformation. It’s what led to my launching WEDI in 2007 in South Africa. With a doctorate’s degree in Juris Prudence from Columbia University School of Law, Sharron presently teaches Project Finance at the University of Cape Town’s Graduate School of Business. She also has a special certification in International and Comparative Law from the Parker School and a BA degree in economics. Sharron defines working very hard and playing hard. When she is not scheming about how to save the world, her favorite thing to do is to lie in her hammock, wiggle her toes in the sun and watch cloud formations. She likes abseiling, driving fast cars, scuba diving reading about the global state of things. Which of your ventures did you submit for the Tony Elumelu Entrepreneurship Programme (TEEP) and how would it change the world? I applied to TEEP in connection with my latest social impact venture which is called Common Ground Productions, and it’s aim is to produce interactive, groundbreaking media that showcases the capacity of young African innovators to solve some of humanity’s biggest challenges. By focusing on African innovation and solutions to global problems, my idea will not only help to change the perception of Africa, but will also bring together innovators, investors, supporters and collaborators in a unique way that will enable young African social entrepreneurs to address some of humanity’s greatest challenges. So, I’m changing the world by providing a platform for young Africans to change the world. I’ve spent most of my life investing in others. Finally, someone saw fit to invest in me. Why did you decide to start Common Grounds Production? In 2007, when I started The Women’s Enterprise Development Initiative (WEDI), I noticed how many young people, particularly young women, contacted me for support for their amazing ideas. Often times, we were not positioned to help them because our target was growth SMEs in certain sectors. I began thinking about how I could help these young innovators get noticed by the right people so they could gain support for their ideas. Common Ground Productions was conceived as the vehicle to make this happen through a reality TV show I call “BigIdeas.Africa”. How did you feel when you heard you had been selected as a Tony Elumelu Entrepreneur? I was actually speechless. I’d followed the results and didn’t see my name and thought, “Alas, I tried. Now back to the drawing board”. But then I got the email announcing I was included in the winners. I then got down on my knees (literally) and thanked God. I’ve spent most of my life investing in others. Finally, someone saw fit to invest in me. It was actually changing my own mindset. My ancestors are Nigerian, but I was born in America. I’ve spent the last 17 years living in South Africa. I’m also older than most applicants, I’m sure (my children are out of University). Friends encouraged me to apply because of the synergies between TEEP and my media concept. But I thought I’d never make it because I believed I didn’t “fit” the profile. Why did you decide to come back to Africa and why did you choose to settle in South Africa, instead of Nigeria where your ancestors are from? In 2001, I was both hit by a speeding car in New York City and almost lost my life on September 11, 2001. After almost dying in the World Trade Center attack, I got the message and decided it was time to return to Africa. I feel safer on the continent. I had developed a base in South Africa when I worked here as a researcher at the Constitutional Court back in 1998. I’ve also worked closely over the years with some pretty amazing former freedom fighters in South Africa who are my friends and who are really instrumental in my coming back to Africa in the first place. My number one business challenge has been finding an experienced media partner to help me produce a pilot. It’s an innovative, interactive media concept that is unlike the average TV show. TEEP not only gives me exposure that helps to attract the right partners, but the process itself forces you to focus and to recommit everyday to making your dream come true. It provides a virtual incubator and networks that include other entrepreneurs that are going through the same changes. So, in addition to everything else it provides, it helps to reduce the loneliness factor that plagues visionaries. You feel that TEEP fellows really do understand you. It’s great! What do you expect your business will achieve with the TEEP benefits? Big Ideas.Africa will win an Emmy Award and will become a global concept that supports young innovators from around the world to launch the big social impact ideas. What is your vision for WEDI and Common Grounds Production? Whether it’s WEDI, teaching project finance, BigIdeas.Africa or advising on sustainable city projects, everything I do is about making life better. I use my formidable gifts to serve others in ways that are fun for me, commercially viable and that have maximum positive social impact. With hope, I’m contributing to creating a better world by investing in high impact visionaries. How do you balance your multiple responsibilities as the founder of two companies and teaching in a university? How do you stay organised? Balance is an illusion. No matter how much I seek it, it’s always just over the horizon. I cope by eating right, praying (A LOT), meditating regularly and exercising six days per week. My priority in the morning is take care of myself. THEN, I look at who and what else requires my attention. That way, I make sure there’s always a healthy dose of me to go around. I stay organised by sticking to what is important to my primary goals in life and I’ve learned to cut out a lot of the distractions. Saying “No” to invitations to get involved with ventures that take you off track is an acquired skill. I’ve learned it. Focus, focus, focus and PERSIST. My recipe for success if based on a version of “P Soup” that I read many years ago in book called Acts of Faith by Iyanla Vanzant. The recipe is: Pray, Plan, Proceed, Pursue AND PERSIST! Starting with prayer is key. Clarity in vision and purpose is a necessary component of resilience. I get clear as to why I’m doing what I’m doing. I trust my Creator for provision that matches the vision. And then I just keep doing what I’m led to do until God delivers on His promises. Faith is really the key to my success. You simply cannot fail using this recipe for success! After nine years in a nursing career, Janine Roberts got interested in the packaging industry and chose to take her interest further by getting a diploma in packaging technology. This led her to work with Fair Packers, an outsource food packing company, in 2009, where she was the Managing Director. Janine’s entrepreneurship journey really began in 2010 when she started her first business, Zimele Packing Solutions, a consulting business in packaging and product development. Unfortunately, that did not work out as planned, so four years after, she closed up shop. 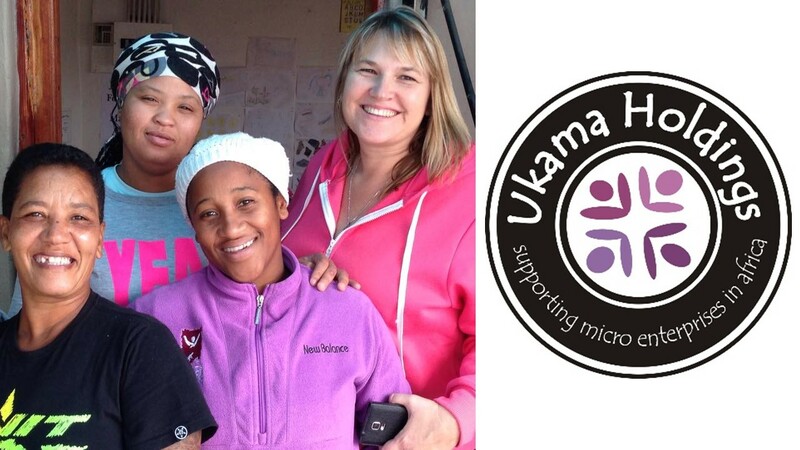 Not one to be defeated by failure, Janine gave entrepreneurship another try in 2014 with Ukama Holdings, a social enterprise started with the aim of creating or identifying micro enterprises that act as a supply chain for various services. Janine is passionate about reducing unemployment in South Africa and helping to ease the daily struggles of children in certain townships, which she does by ploughing some of her time into the Ukama Community Foundation. She loves reading and spending her free time with her family at home or out camping. Why did you start Ukama Holdings and what does the company do? Ukama Holdings was started to address the needs of unemployment in South Africa, as well as cater to the need of small, medium and large companies needing to outsource their production and packing. In South Africa, we have huge unemployment rates. I sincerely feel that solving the unemployment problem lies in alleviating poverty and that this can be done with our unique business model. Ukama provides contract packaging for customers in a food grade facility using solely micro enterprises as our supply chain. 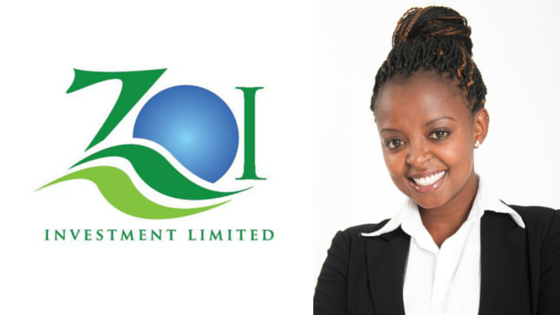 We identify, train, set up, and provide work and premises for micro-enterprises in our business. These micro-enterprises serve as the supply chain who pack products for our customers. Each micro-enterprise owner employs up to five people. In this manner, we have created jobs for over 60 people already. We have over 20 customers who use our services for production and packing of food products, non-food products, sewing, crafts and labeling. I felt that there was a gap in the market for a lot of the niche services we offered. I had over ten years’ experience in the packaging sector and I felt that we could offer an amazing service to clients. How would Ukama Holdings change the world? Our business model is unique and sustainable. Not only do we offer a valuable service to other businesses, but socially we are also empowering people and creating jobs. The model is easily scalable and repeatable and makes huge in-roads to massive unemployment problems in Africa. We also enable small businesses to get to market by packing their products for them in a fully accredited food facility. This is something that is expensive and unobtainable to many small businesses. What is your biggest business challenge right now and how do you think the Tony Elumelu Entrepreneurship Programme will help address it? My most difficult challenge has been raising capital and getting finance in South Africa. I hope the programme will address this through the process of being able to apply for capital and through the new contacts that I will make. With the exposure, networking and funding we will receive, we’ll be able to take our business to a new level in our expansion project. Being an entrepreneur takes amazing strength, courage and perseverance. Sometimes it seems that you will never get where you need to be! The thing that has kept me going is my faith, the knowledge that this is my life purpose, and that the journey is worth all the struggles I’ve had to endure. Never give up! *To find out more about Ukama Holdings, visit their website and follow on Twitter and Facebook. **We are sharing the stories of 30+ African women entrepreneurs who are beneficiaries of the Tony Elumelu Entrepreneurship Programme. and whose ideas can change the world. Follow the TEEPcofoundHER series HERE. Tracy Owamagbe and Omowunmi Akande met at Bells University in Ota, Nigeria, and, even after their graduation in 2010, have been best friends ever since. Last year, the two travel buddies had planned to take a trip together, but postponed their plans when they decided to use their savings to start Smoothie Express instead. Born and raised in Benin City, Tracy has always had a keen interest in entrepreneurship and even though she has worked with corporate firms like Hewlett Packard and Ericsson, she never gave up on her entrepreneurial dream. 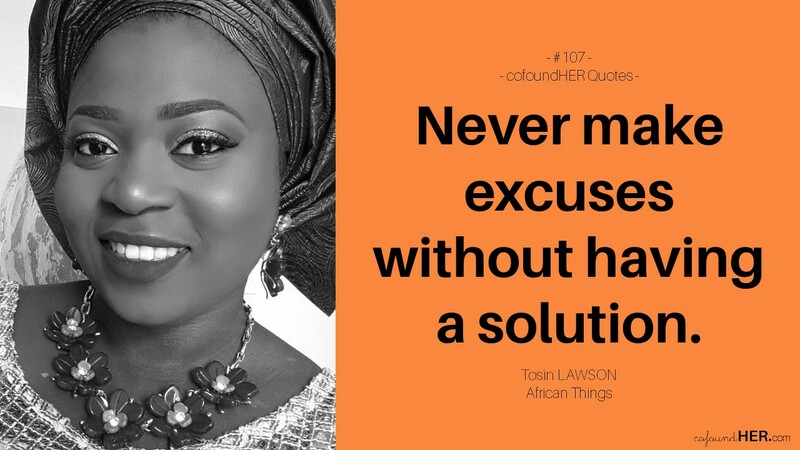 Her mantra is: find a solution to a problem and make a business out of it, and two women she looks up to are Hajia Bola Shagaya and Folorunsho Alakija. When Omowunmi was much younger, she wanted to be a doctor. That changed sometime in the middle of her university education when she realized her passion wasn’t really in medicine. After graduation, she worked in OANDO Plc and Cambridge Manufacturing Company, but she knew she wanted to be her own boss some day. What does Smoothie Express do? Tracy: We deliver richly blended fruit smoothies to our customers’ homes, offices, schools, and so on. One smoothie at a time, our goal is to become a daily part of our customers’ lifestyle, helping achieve their health goals by bringing our smoothies to their door steps. Omowunmi: Smoothie Express strives to assist people to live a healthy and active lifestyle and our vision happens one smoothie at a time. Our smoothies are thoughtfully divided into four core categories: Regular blend that cater to everyone, from children to the elderly; Weight loss blend specially designed for people looking to lose or maintain their weight, Fitness blend focused more on the gym freaks and body builders; and Kiddies blend for the younger generation. How did you come up with the idea for Smoothie Express? We talked and talked about it and I was sold immediately and because we had been saving up, we had a bit of capital to start up. This was how Smoothie Express came into existence. Tracy: I was trying to do a smoothie detox, and I noticed my major problem was time! Then the idea popped up one morning on my drive to work: what if I delivered smoothies at work? How easy and convenient will it be? I called up Omowunmi, who I had been planning a holiday with for a while. She worked with Cambridge Weight Loss Company, and she was the perfect person to actualize this dream with. So, we postponed our holiday (which we are still yet to take, lol) and decided to start up Smoothie Express. It’s not been easy, but i’m glad we took this step. We started up with just one dispatch bike. At first we were meeting all our orders, then it became impossible to keep up as the orders increased. Eventually we got another bike and it was okay for a while till it wasn’t again. Eventually we had to liaise with a logistics company. We plan to increase our fleet by the end of the month. How will Smoothie Express change the world? Tracy: We aim to promote healthy living in every neighbourhood. Having well prepared smoothies delivered to one’s doorstep is a huge convenience. We want to make the healthier option more available to people around the world. How did you feel when you heard you made the Tony Elumelu Entrepreneurship Program list and what was the hardest part about applying? Tracy: We were super excited. We realised we had found a platform to build this company and actualize our dreams and visions for it. The most difficult part was the number of questions. There were a lot of questions and it seemed the application was never going to end, lol. What is your number one business challenge? Tracy: Our number one challenge has been logistics. We hope to expand our delivery fleet with the grant from the Tony Elumelu Foundation. What do you expect your business will achieve with the programme benefits? Omowunmi: Tony Elumelu Entrepreneurship Programme has been designed to grow startups and help entrepreneurs with ideas that have the potential to succeed. We are given access to a framework that includes mentorship, online and live learning as well as access to information, networking and seed capital and I am so grateful for this opportunity that would not only help build our brand but groom us to achieve professionalism. Tracy: It’s difficult building an empire, when obstacles come (they will always come), look for the smartest, simplest way to solve them and move on. Never give up. 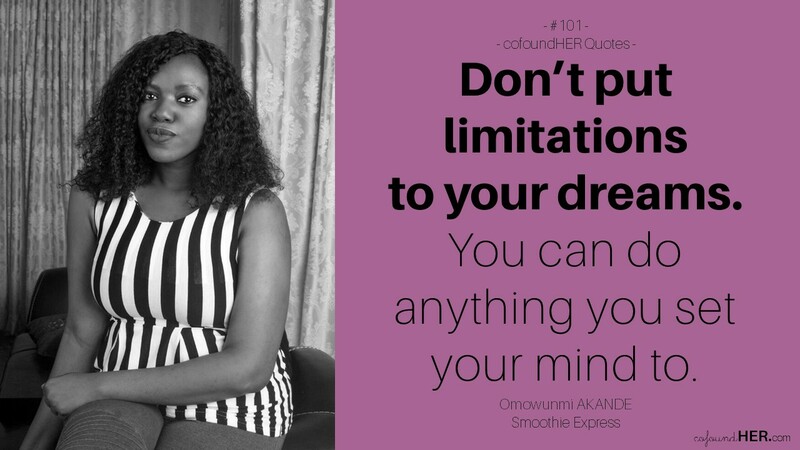 Omowunmi: Do NOT be afraid to dream big! Don’t put limitations to your dreams, remember you can do ANYTHING you set your mind to. God has given us this wonderful gift called instincts, follow them because 90% of the time they’re always right, regardless of what people think. Pray! Pray! Pray! Pray like your life depends on it. Hard work will get you far but prayer AND hard work will get you farther. And lastly never give up. Don’t even let it cross your mind, have a positive spirit all times and let your optimism come true. *To order your own smoothie and learn more about the ladies behind Smoothie Express, visit their website or follow Tracy and Omowunmi. 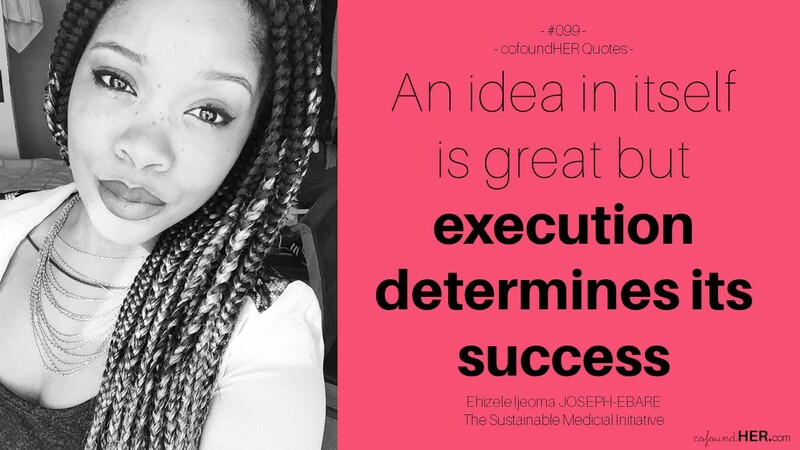 When it comes to effectively managing multiple responsibilities, Ehizele Ijeoma Joseph-Ebare is one person we admire. 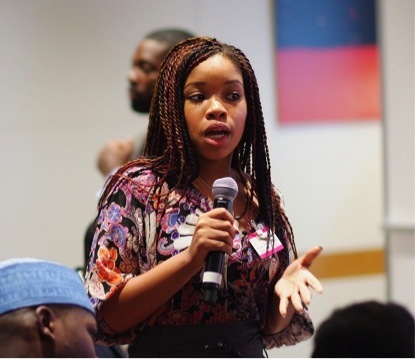 Currently studying medicine at Barts and the London School of Medicine and Dentistry, Ehizele started her first venture at 21 because of her love for people and a passion to change their lives. Now, she is about to start a for-profit company that leverages technology to provide accessible healthcare. I am studying medicine in the first place because of the opportunity to change and possibly save someone’s life. I then considered, what if an idea I have can change millions of lives not just the ones I see on a day to day basis. This led me down the entrepreneurial path. When she isn’t working to make healthcare more accessible to all, she loves dancing, listening to music (especially anything by Flavour) and reading. What is your company, The Sustainable Medical Initiative, about? To keep it short, The Sustainable Medical Initiative (The SMI) focuses on introducing telemedicine to Africa in a new and unique way using technology. I want to deliver health in a new way to the African Continent and perhaps beyond. The SMI, through various products, will target people from all walks of life who are in need of medical attention. Being sick is hard enough, accessing health should be easy. We bring healthcare to you, eliminating barriers and the need for the ill patient to actively seek it. I know I am being rather cryptic but watch this space! I hope to roll it out this year and expand fast. How will The Sustainable Medical Initiative change the world? The healthcare industry is so vital because every human being is susceptible to falling ill. As a student of medicine, I have come to understand that the human body, though so intricately designed, inevitably meets glitches that result in illness. This means that amazing health ideas literally can change the world. My idea aims to break down the barriers to accessing healthcare. This is something people all over the world, particularly in the Global South, experience. We will make it easy for rich and poor alike to see a doctor, get a diagnosis and get recommendation on treatment. Say goodbye to closing times, long waits, long trips, all these things that are almost unbearable when you are ill.
Well, I am a young woman who believes that in life the real tragedy is not death, but a life without purpose. I work with the motivation that my vocation is to change people’s lives and that’s exactly what the SMI will do. I am also a charity founder in the UK and have an NGO based in Nigeria. For as long as I can remember, I have wanted to not only change lives, but save them. Tell us more about the the charity and NGO you founded. My charity is called the SMI – the Sustainable Medical Initiative, the NGO the same. I set them up because I know I will want my business to have a strong link to social responsibility not just a page about charity on a website. Also, I feel that charities tend to leave a culture of dependency. I stand for something different and that is long term change. The people I help, I want them to be able to help themselves and even others, not just wait for someone else to come along. The charity is based in London and we have partnered with people who will be happy to donate medical items to Nigeria. The NGO side is in talks with hospitals and the Imo state government (where my mother is from) to partner on helping there, of course when the political scene is settled. How do you manage being a medical student, having a charity, an NGO and now starting a new business? It certainly is not easy. It means you waste no time. If most people think about their day, there are moments of hanging around or procrastination. I used to have those too! However, deciding to take this on and start young, means I have no dull moment. It’s about productivity. If I’m not doing business I’m doing med school. Why don’t you have a cofounder? Who helps out with your business? I do have people who will work on my project with me but I wouldn’t say they are cofounders. This is not for any particular reason. I have a lot of support and people who believe in my idea and have seen my vision. The business is currently transitioning from idea to set up stage, and we aim to launch later in the year. How did you feel when you heard you made the Tony Elumelu Entrepreneurship Programme list? I was very excited. It took a while to register. I had just finished an exam and also just received an offer to study a Bsc in Global Health that I applied for. It was such an intense day. My automatic reaction was to call my brother who always makes me feel good about whatever I achieve. I then called my parents who were very proud of me; their approval is something I have always sought. However, I must say, the happiness of winning was swiftly followed by the realisation that this journey has only just begun. An idea in itself is great but its execution determines its success. The most difficult part about applying was the wait! The application process in my opinion was straight forward. Well starting with the obvious, I will be able to start up with the funding provided. In addition, my business will gain some weight to approach other investors; being a TEEP winner is an achievement I would say. Fundamentally, my business will now have a CEO/founder (myself) who is much more equipped to manage this company after the duration of this programme, which has already shown to be educational and thought-provoking. As a business woman there are three ‘categories’ I fall under: An entrepreneur, a woman, and a young one at that. As I have said to many entrepreneurs already, focus on your motivation for business. Why do you do what you are doing? Whose life do you want to touch? What about our continent do you want to change? This is what will wake you at night. This will push you when things do not seem to be going your way. To women as myself, it is crucial to remember your dignity has no price. In the world we live in many will try and exploit you based on the fact that you are a woman. This is not an excuse to succumb. Have confidence in your ideas and keep pushing regardless of the obstacles along the way. Finally to those who are young. I started setting this up since I was 21. It is never too early. Do not doubt yourself based on your age. If you have a good idea, run with it. A battle is won with advisors. Do not fail to seek advice and guidance, but never be discouraged by your age. All the more time to make mistakes, learn from them and finally, to succeed. **Follow the TEEPcofoundHER series HERE.